The French are world renowned for their classic chic style. Sometimes I wonder if they really are that stylish or it's just that we only get to see the chicest of the population - I mean, how is it possible that there's not one socks and Crocs wearing catastrophe out there?! In any case, the mystique lives on and what could give one a more classically French or European look than a patterned silk scarf? French artist and designer Mona Roussette is stepping out into the fashion market with her first collection of seven silk scarves. Each of the designs in this capsule collection are original works of art designed by Roussette herself. 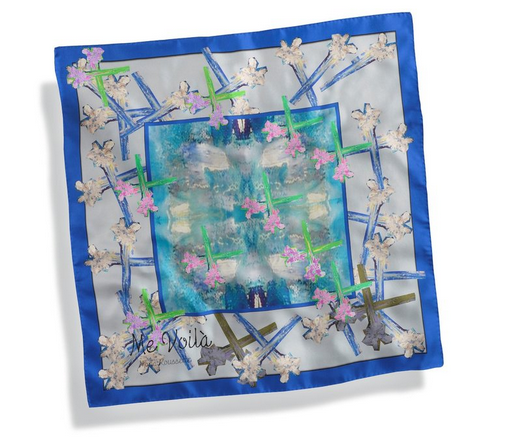 Out of the collection my favourite by far has to be this Me Voila (Here I am) scarf available for $258. The bright blues and light pinks recall the sakura festival I attended earlier in the year and I can imagine that it would look beautiful draped casually around the neck during the evening or used as an elegant bandanna. You can view this and the rest of the collection online for now, but it will be coming to Canadian retailers in early 2014.